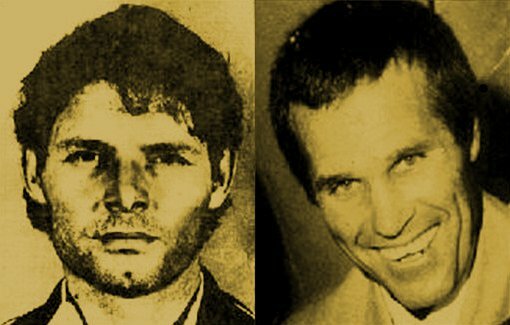 John Andrew Stuart (left) and Jim Finch (right). It has been over 40 years since Brisbane’s 'Whiskey au Go Go' nightclub was firebombed. Five gallons of petrol were ignited in the foyer of the packed Fortitude Valley club, and 15 people were killed in the panic that followed. It was, until the Port Arthur shootings of 1996, modern Australia's worst mass murder. John Andrew Stuart and Jim Finch were the two men sentenced to life for the firebombing. Stuart and Finch were both violent men and had spent most of their adult lives embroiled in gangland feuds over rich prostitution and gambling rackets in the south. They claimed that they had been framed for the murders, and their protests of innocence were incredible, as were their attempts to delay the trial. Much has been written about the case and the guilt or innocence of the two men over the years and this debate continues today. Despite this, Stuart and Finch have already gone down as two of the most notorious prisoners in the history of Boggo Road. While being held in the now-demolished No.1 Division of the prison, Stuart and Finch desperately tried to convince everyone that they were innocent. At one time Stuart silently sewed his lips together with a paper clip. On other occasions he ate wire crosses and nails that lodged in his gut. This required him to go to hospital for treatment and so delayed the trial. This inspired other prisoners to do the same. He even climbed up on the roof of the old A Wing for three days in 1977 and pulled out dozens of bricks with his bare hands to spell out the words 'INNOCENT - VICTIM OF POLICE VERBAL' on the roof. Two officers were eventually sent up to retrieve Stuart, who was by this time riddled with bird lice. A favourite trick of Stuart’s was to greet the officers unlocking his cell door of a morning by throwing the contents of his toilet tub over them. Many a new officer got a soaking like this. Some thought Stuart had a masochistic streak, and he would taunt groups of prison officers who had just bashed him with words like ‘is the best you can do?’, almost willing them to do it again. 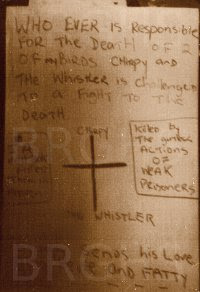 His actions sparked riots and won him widespread support both inside and outside the prison, but he was never released. Stuart died of a heart infection (idiopathic myocarditis), alone in his cell on New Years Day 1979. He had been on hunger strike for six days. Jim Finch also made memorable protests, including a 35-day hunger strike. His most famous stunt was to have the top of one of his fingers cut off at the same time as swallowing a wire cross. He falsely claimed that he bit the finger off himself. 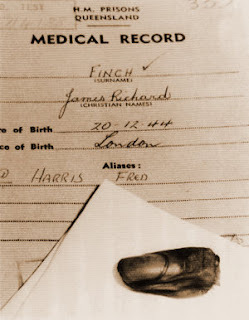 I understand that this bit of finger was kept for years in a jar (and may still be around somewhere) and at one point after his release Finch put in an unsuccessful official request to have it returned. He was a fitness fanatic and was known as 'The Chinaman' because he would jog with two buckets of water suspended from each end of a prison mop over his shoulders. He later settled down to become a supposedly 'model' prisoner, although he was still regarded as a violent thug by some inside Boggo Road and certainly ruled the roost in his exercise yard. He did however, have a knack for staying out of trouble and was often suspected of deliberately getting himself sent to the Detention Cells for minor infringements just before any major trouble was due to break out in the prison. We can safely assume that this 'fight to the death' never happened. Finch was also a boxing expert, and loved to get officers to quiz him on boxing trivia using a set of little quiz cards he owned. He knew every answer. He campaigned and wrote a lot of letters and drummed up support for his release, and in 1986 he even got married to one of his supporters while in prison. In 1988 he was released and deported to his native England, where his new wife soon became aware of his violent side and left after a few months. Finch, who found work as a nightwatchman, later confessed his guilt in the Whiskey au Go-Go case to a journalist before changing his story again after being informed that he had only been sentenced for one murder and could be charged with the others. He has since died. Whether guilty or innocent, Stuart and Finch certainly left their mark on Boggo Road history. Although the scene of their incarceration has long gone, the stories of their time inside will continue to be told.